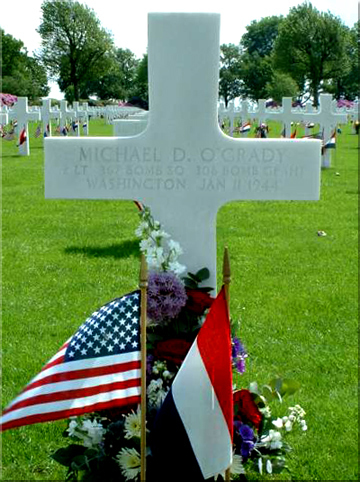 Michael was born in 1917 as a son of Patrick O`Grady and Minnie May Fergusen Young. He and his four sisters grew up in Spokane County, Washington. His mother already had two children from a previous marriage, so Michael had a halfbrother named George and a halfsister with the name Arli. His sisters who were born from the marriage of his father and his mother were Julia Honoria and Florence Kathrijn, who passed away on 2 June 1989. He had another sister Margaret who died on 4 June 1963, and his fourth sister was named Patricia Mary. Over the years all his sisters have died, they were all married and had moved to Sacramento, Portland en Irvine. Michael went to Elementary School and High School in Spokane, WA, followed by two years of study at the University of Gonzaga, trying to get a Law degree. He had plans to work at his halfbrother´s business after his servce in the Army. Michael and his sister Patricia. When Michael met Shirley Jean Parker, he was serving with U.S. Army Infantry, guarding an oil installation in the south of California. 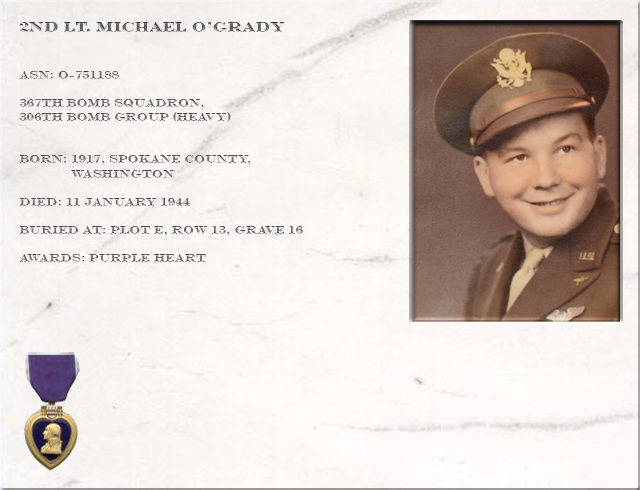 Shortly after he and Shirley got to know each other, Michael was assigned to the flight training school where he awarded his wings in Douglas, Arizona on 26 July 1943 at a Dinner and Dance at the Officers Club. 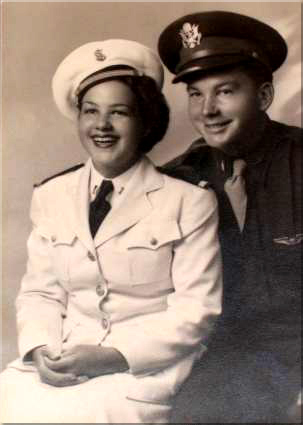 Two days later, at Wednesdaymorning 28 July 1943 he actually received his wings as a member of Class 43-G.
After his graduation Michael and Shirley were married at 15 September 1943 in Kearney, Nebraska, Here they also met their new friends Jean en Arthur Crapsey. Michael and Arthur were both to be a member of the same B-17 crew. Michael and Shirley on there weddingday. 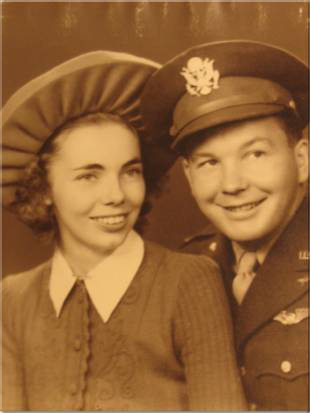 At the moment the B-17 crew was shipped to Europe with the 'Queen Mary', at that moment deployed as a troop transport ship, Michael and Shirley were living together at Manhatten Avenue, Hermosa Beach in California. After Michael's death, Shirley remarried in 1949 to Damon Stetson, a newsreporter with the New York Times. They had two children, Nancy en David. Shirley received Michael's ring in 1946 when he was re-interred at the Margraten cemetery from the temporary burial grounds in Raalte, the Netherlands. As soon as Michael had arrived in England he was sent to Thurleigh. At Thurleigh the 8th Airforce, 306th Bombergroup, 367th Bombersquadron, Heavy had it´s base. Michael arrived here on 19 November 1943 with the crew of Arthur H Crapsey, but this crew was not to fly as a unit. Pilot Arthur replaced another pilot and had to fly a mission to Emden, Germany with an entirely different crew on 11 December 1943, followed by a mission to Osnabruck on 22 December 1943. At this mission the B-17 was hit causing five casualties and Arthur losing his right leg. I have contacted the son of Arthur Crapsey and he told me that his father after returning from the war worked at Eastman Kodak consumer products, where he remained for the rest of his life, working with photography related aspects. He never spoke much about his experiences during the war years, but always told others that boys like Michael were the real heroes. From the retreived information we gathered from mission reports and the squadron diary, Michael only flew one mission, on Tuesday 11 January 1944 in a bombing run on Halberstadt trying to hit the Junkerplane wing factory. The leading group of the 306th missed their target dropping their bombs north east. The following group, the 92nd Composite Group did hit the target. Of the 306th 17 planes did not return that day. Later it appeared that this loss on that day was the heaviest for the unit during the war. 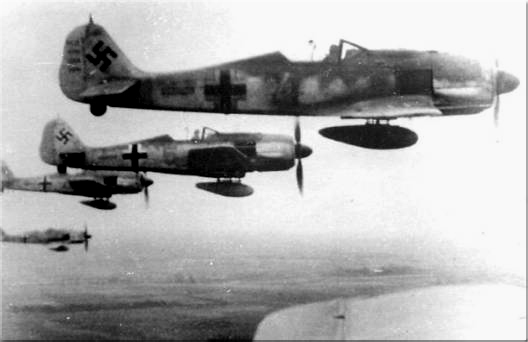 On their way to Germany the bombers had to tackle numerous attacks from the German Luftwaffe and airdefense. Some planes were lost during these attacks. 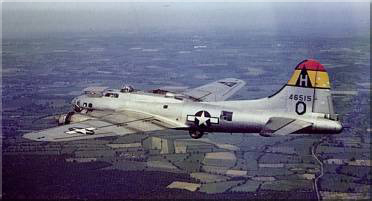 A B-17 of the 306th Bomber Group, 367th Bomber Squadron. The biggest problem for the bombers was the shere lack of defense by allied fighter planes. On their return flight the planes remained mainly unprotected. West of Nordhorn the planes were spotted by German fighter planes of the I/JG 26 which had taken off from the Belgian airfield of Florennes. Our group took off at 12.22. Leading was Gruppen Kommandeur Hptm Karl Borris. Above Brussels we were confronted with a closed cloud deck at a height of 2000 meter. Suddenly we spotted a formation of 19 B-17´s west of Nordhorn, unprotected. They did not believe their eyes, such an occasion had not occurred in a long time. His voice still full of disbelief Wiegand reported : `clean air´. With Hptm Borris leading the German Focke Wulf`s gained in on the allied formation. The Americans started to get nervous and tried to tighten the formation. It seemed it took hours before the Germans gained enough distance to turn and set in a frontal attack. Then the Germans turned to an attack angle aimed at the right wing of the B-17 formation. Wiegand followed Borris and they manouvered into a an attack position at the left wing of the bomber formation. Then Wiegand opened fire "20 degrees sidewards, 10 degrees high, 1,5 revirodius. His round hit the target, one of the wings of the targeted B-17 was separated from the fuselage. This B-17 with the name Norah and registration number 42-31538 was flown by pilot 2nd Lt P. Cavos en co-pilot 2nd Lt Michael D O`Grady. The plane was out of control now and broke loose from the the formation in a backward fashion and in this uncontrolable flight the B-17 collided with bomber right behind the Norah, piloted by 1st Lt. George Campert. For a moment it seemed as if both planes were able to fly level but soon both aircrafts dwindled down fast and crashed. Michael's plane crashed on the land of the Dutch family Bessembinder at Nieuw Heeten. Returning crewman in other aircraft information report that they saw a violent explosion in the nose of the aircraft Michael was flying on. Another crewman report seeing the body of either the navigator or the bombardier hurled out of the aircraft. The aircraft went down apparently completely out of control. No parachutes were observed. From a certain Mattijs we received the report that one of the crewmembers came down in the meadow behind his father-in-law's house. Nineteen of the twenty casualties of both planes were buried at the general cemetery of Raalte. 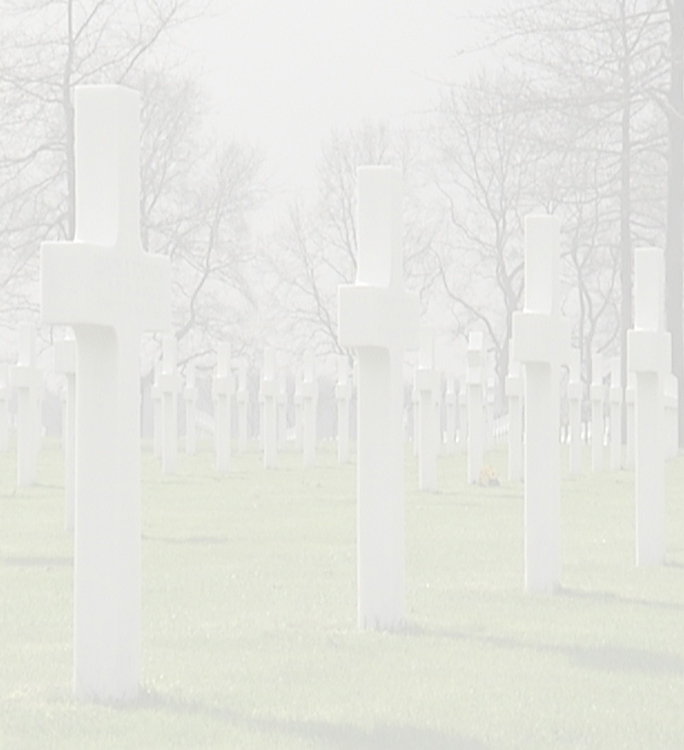 After the war their remains were re-interred at the American Military cemetery at Margraten. The twentieth casualty was Cpl. 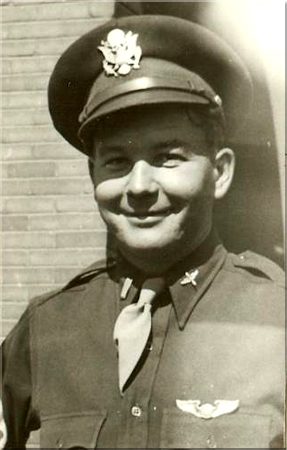 Samuel Sin, one of the waist-gunners of Michael`s plane. He was taken to the hospital of Almelo where he died a day later. Michael's remains were also brought over to the cemetery at Margraten, where he rests in all the quietness and peace he deserves. Oh! I have slipped the surly bonds of earth. High Flight by Pilot Officer Gillespie Magee. Mr. Ralph Franklin, British Representative 306 Bombergroup. Mrs. Nora Dougherty Costello, Daughter of 1st Lt. John L. Dougherty, Navigator of the plane of Lt. George Campert.